The Graveyard Rabbit: Meet Marilisa, Author of "Mopsie Rabbit's Cemetery Memoirs"
Meet Marilisa, Author of "Mopsie Rabbit's Cemetery Memoirs"
After a one of my grandmother’s famous southern dinners of either chicken and dumplings or hot, delicious fried chicken, mashed potatoes and super-secret recipe biscuits- Jess would quietly disappear to an ambiguous place in his bedroom known only to him, and come back carrying a non assuming, brown cardboard tattered shoe box, most likely once housing some tres chic 1950’s penny loafers. My grandfather, Jess, was very matter of fact about the whole clandestine viewing. Didn’t every granddaughter look at graphic pictures of dead folks? The images in that box, I will never forget. Most were original photographs from the 1880s. One in particular told the sad story of some unscrupulous horse thieves, who had the misfortune of their deeds catching up with them and suffering the swift punishment that was routinely meted out in those days. In a rather large barn, swung eight men’s lifeless bodies which starkly hung from their sturdily roped nooses, boots on and all- while oblivious horses continued swishing their tails and eating hay- as if nothing out of the ordinary had ever happened. Yeah, yeah, Granddaddy. Like I really care about that. Nonetheless, as the years went by, to my surprise, I in fact, DID start caring about that! Genealogy. Family history. Who were they? Where’d they come from? I began to become completely and unabashedly enthralled. As I read the church minutes all the way back from the late 1800’s to 1924- moderated and signed by my great grandfather; I was hooked. When I stood in front of their graves for the first time- Rev. J.J. Moore and his wife Mary Agnes Donnell Moore, playfully listed as“Aggie” on her wedding certificate and rumored to be the illegitimate daughter of President James Buchannan, no less, I was REALLY hooked! Furthermore, to discover that my people came to Lewisville, Texas in a covered wagon and were not only listed as one of the first families of Tennessee, but also the original pioneers of the town in which I now live, was nothing less than enchanting. Interestingly enough, my great uncle, Urban, sister to my maternal grandmother, Maude, (could they name kids back then or what?) was the first person in town to have air-conditioning! Urban owned the downtown pharmacy from 1911 to 1961. That’s a pretty slick business move to spring for this new-fangled AIR CONDITIONING, further compelling his customers to come in on a hot day and enjoy banana splits served from the little soda fountain, complete with white railed ice cream parlor chairs. I also, am a business owner (three companies) and entrepreneur. I can’t help but wonder if this propensity for business started back several generations way before I was born? I believe that Uncle Urban would think so. Even though my family came to this area over 128 years ago, yet, I have a little bit of them with me even now. For I know the man who owns the local Feed Mill in Historic Old Towne, James Polser., Mr. Polser’s family and my family- have known each other well over one hundred years! Talk about being connected to the past. Also, James and I carry on the tradition of meeting the first Sunday in May at Old Hall Cemetery, for Cemetery Decoration Day, just the same as they did all those long years ago. Should you stop by and visit my family’s grave, the Moore’s, feel free to leave a rock. I always do. A natural progression of events was for me to become a Grave Yard Rabbit- as I apparently have been one for quite some time. I just didn’t know it. My name is Marilisa. My blog is called, “Mopsie Rabbit’s Cemetery Memoirs” and I’d be glad to have you visit anytime. 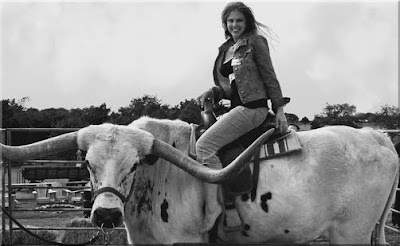 "Everyone rides these in Texas!"